No exaggeration here, as the weekend was the worst Super Bowl weekend in nearly two decades and the slowest weekend since September 2017. Miss Bala, the only new wide release, was a distant third while Glass topped the box office with a sub-$10 million performance. All in all, it was a rather yawn-inducing weekend for Hollywood, but luckily this downturn will be short-lived as the rest of February is packed with big releases that will turn things around in short order. Our number one film for the third week in a row was M. Night Shyamalan's Glass. Dipping 49.5%, Glass brought in $9.5 million, giving the film a new total of $88.65 million. While this will certainly be the last weekend that Glass comes out on top, the film, which rounds out Shyamalan's trilogy of Unbreakable and Split, is going to top $100 million and is on course to end at around $115 million. That's still very good next to its $20 million budget, even more so when you consider its $110.3 million foreign total - as it now sits at just a hair under $200 million worldwide. In the end it should just about match the $249 million global total for Unbreakable - but it will still win in the end as that film cost $75 million back in 2000. All in all, Glass might not match Split, but it is still a worthy follow-up and another win for everyone involved. Hanging on to its second-place spot, The Upside took a 26% hit and added another $8.85 million to its total, which is now sitting at $75.6 million. The $37.5 million has now doubled its budget as it looks to get close to that $100 million mark by the time it ends its run. It also officially passed A Bad Moms Christmas ($72 million) to become the second-biggest earner for STX Entertainment. It won't be able to top Bad Moms ($113 million) but the film is still going to come out a winner and, along with The Mule, is one of the biggest dramas of the past few months (that isn't a musical). It's also a much-needed boost for Kevin Hart, who has had to deal with a lot recently, but if he can show humor and heart, it opens the door for bigger and better things to come along and I think, in the end, he will wind up just fine. The only new wide release for the weekend had an unremarkable opening as Gina Rodriguez-led drug-fueled thriller could only muster a $6.7 million opening. That is on the low end of expectations and the middling reviews certainly didn't help. I would like to say that women and a Latino audience mostly drove this one - but I can't as Cinemascore does not have any statistics up about audience attendance. 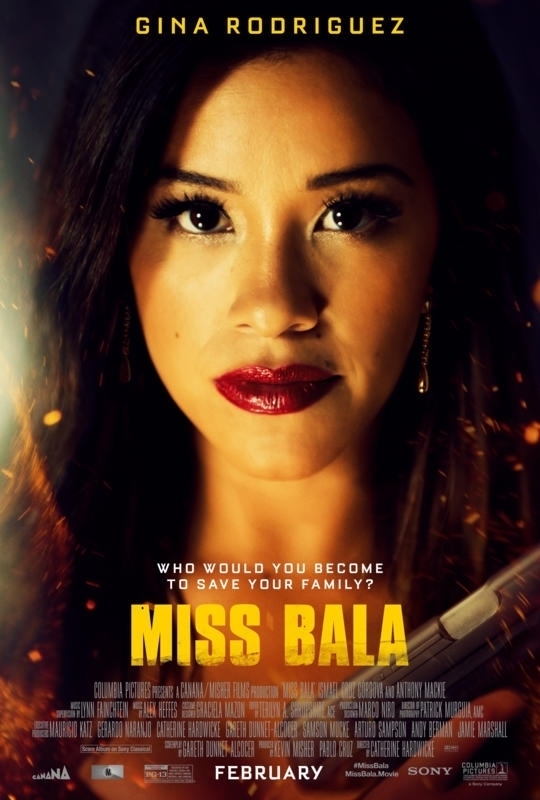 What I can say is that movies that have done well over Super Bowl weekends in the past has targeted women or have been horror films - and Miss Bala doesn't quite fit in with either of those categories. The PG-13 might have brought in a broader audience, but also blunted the cruelty and horror present in the original film. And Rodriguez, for all her talent, hasn't been on the big screen front-and-center and may not have been a big enough draw. This one isn't going to last long and will be lucky to do much better than its reported $15 million budget with $20 million being about the best scenario. Aquaman is flirting with that $325 million milestone after a $4.78 million weekend (down 34%) and a new total of $323.5 million. It also puts it within a day or two of surpassing the totals of Suicide Squad ($325 million) and Deadpool 2 ($324 million - including the re-release Once Upon a Deadpool). If it sticks around long enough, it should be able to top Batman v Superman ($330 million) and Guardians of the Galaxy ($333 million). It is also one of the leggiest superhero movies of all time and its $783.4 million foreign total is the second best of all time for a solo hero, behind only Iron Man 3 ($805 million). Its $1.107 billion puts it between Transformers: Age of Extinction ($1.104 billion) and Skyfall ($1.108 billion). Once everything settles, it looks to settle into the 20th all-time highest-grossing film worldwide. I guess this means we are officially over the dark and brooding superhero narrative (for now). Holding on to its fifth place position, Spider-Man: Into the Spider-Verse dropped a light 27.8% after eight weeks in theaters, adding $4.4 million to give the animated hit a new $175.2 million total. Like Aquaman, this is also a hugely-leggy film, for animated and superhero titles alike. It also passed the total for Hotel Transylvania 2 ($169 million) to become the biggest domestic hit for Sony Animation. It also is going to very soon pass The LEGO Batman Movie ($175.7 million) to become the biggest animated superhero movie of all time. It had earned $347 million worldwide off a mere $90 million budget, not to mention all the awards it has piled on (and, I'm assuming, an Oscar is also in the picture). I am still very impressed by this film - animation and story both come together and wholeheartedly recommend you see this before it leaves theaters. Outside the top five: Peter Jackson's much-praised WWI documentary They Shall Not Grow Old (which already earned an impressive $8.3 million from single-showing events) entered the top 10 with $2.4 million on 735 screens. While it may not be as crowd-pleasing as some of the blockbuster films, on a technical level this looks nothing short of a masterpiece and I wish it the best. Heck, at this rate ($10.7 million and counting) it may top the Jackson-produced Mortal Engines ($16 million). In milestone news, Escape Room crossed the $50 million mark with a $2.9 million weekend (9th place) and a new $52 million total. Another good example of low-budget horror ($9 million to be exact) coming out on top. Next week brings a bit more excitement with four movies dropping - The LEGO Movie 2: The Second Part looks to lead the pack, with the horror film The Prodigy, comedy What Men Want and action-oriented Cold Pursuit also vying for attention.